In a brief article, Justin Osofsky, Facebook’s VP of Media Partnerships and Global Operations announced the launch of “Stories to Share”. 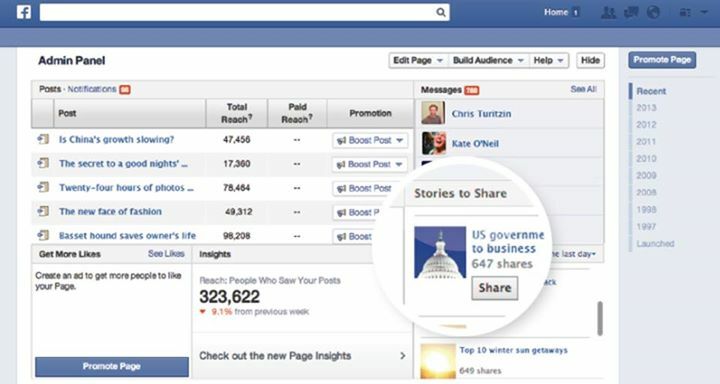 This new tool is aimed at media pages and its purpose is to increase referral traffic. Facebook has been silent about this new feature, as they have been testing it with media organizations for over a week. Taking into consideration that the social media platform is the biggest referral traffic generator, Mr. Osofsky reported huge spikes in traffic generated from facebook for some of the leading media organizations. For instance, for one year span (September ’12 to September ’13) Time’s referral traffic has increased by 208%, Buzzfeed by 855% and -hold your breath- Bleacher Report by 1081%. “Within that week, the media sites averaged an increase in the number of articles they posted to their pages by 57%. This resulted in an 89% increase in average outbound clicks to their domains. Additionally, the amount of Likes per post increased by over 10% and the number of net fans per page went up by 49%”. Impressive, indeed. So, starting today, Facebook is initiating the official, public, testing period for “Stories to Share”. A media organization can now see how their stories perform with their fans and readers and suggest ones that could increase their traffic, but that haven’t been shared by the page. This button (most likely a button) is directly accessible through the admin panel for greater ease of use. We are now waiting for the new function to be available on all media pages.